Star Wars is back. Last night, after a long, excruciating wait I finally saw The Force Awakens. Without spoilers: it was incredible. And today I woke up (we’ll pretend I actually slept) and I thought How can I tie this into packaging so I can blog about it? I’ve only ever done it here. And here. Also here. Fortunately, I thought of something. In all seriousness, this one’s a doozy. Branding. It’s at the heart of everything we do. Every logo we put on a flash drive, every custom box we foil stamp, we are helping businesses build a stronger brand image. Something so memorable that a customer associates the product with a solution. It’s the backbone of marketing, retail presence, and the aesthetics of packaging. And nobody does branding better than Star Wars. Star Wars licensing is an interesting story, historically-speaking. Starting back in the 70s when George Lucas managed to retain licensing rights. This was rather unheard of, but technically the Star Wars films are indie flicks. Especially the Prequel trilogy, almost exclusively funded by Lucas himself. But what a payoff, right? Think of every product you’ve seen with the Star Wars logo slapped on it. Of course, Lucas sold the property to Disney. To the tune of $4 billion. Insert R2-D2 wail here. As big a company as Disney is, you can’t blame them for trying to turn a profit on their investment. Think about this: The Force Awakens has earned $100 million in advance ticket sales, but that’s still only 1/40th of what they paid for the franchise. Add to that the actual cost of making a special effects blockbuster and you realize they have a long way to go. Brand away! But how come other movies don’t do that? Well other movies are usually set in modern, Earth-based times, and fill their shots with branded items and product placement. Unfortunately for Star Wars, a character can’t whip out an iPad or use a Samsung lightsaber to offset the cost. 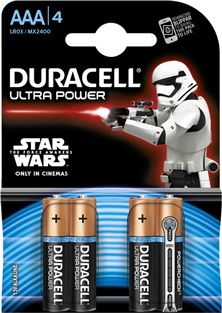 Thus, you can’t fault the franchise for allowing Star Wars batteries to exist. Whether you think there’s too much Star Wars in the world or not, you can’t deny the power of branding. It’s more than just your logo on your product, it’s building a legacy. An empire, if you will. Familiarity is key to building market trust, and what’s more familiar than a brand that is everywhere? So, as in all things, take a page from Star Wars. When it comes to custom branded packaging, do or do not–there is no try. At Sunrise Packaging, we sincerely hope you do. And when it comes time to design that perfect packaging solution, remember that ours are the best in the galaxy.